Do you want to whip up a healthy dinner on the table on a busy weeknight? Thinking about changing up flavors so dinner won’t be boring again? Making stir fry sauce in advance is the perfect solution. Over the years, I found out that mastering the few key components of stir frying is much more useful than just learning a recipe. 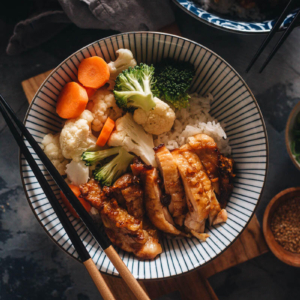 That is – to understand the process of stir frying, how to choose and prep ingredients, and how to make a great stir fry sauce. 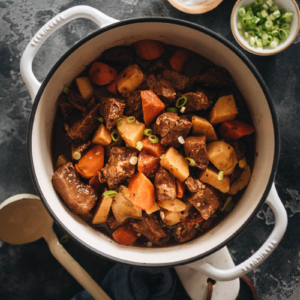 If you get these few tools under your belt, not only can you make your favorite takeout dish in your own kitchen that tastes even better than those in Chinese restaurants, but the whole process will become less intimidating – and the results more delicious! Moreover, understanding the key techniques will make your meal planning and prepping more flexible, because you can use whatever ingredients you have on hand, instead of hunting down an ingredient just to follow through the recipe. 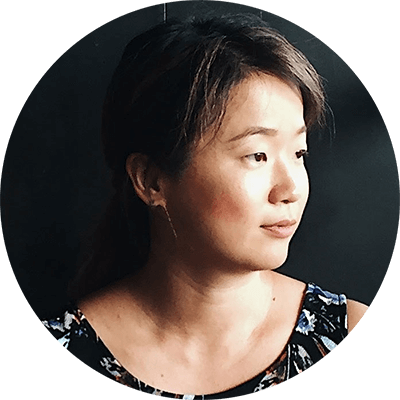 Even better, I will share all the secrets of how to use stir fry sauce to create quick and healthy meals, without stir-frying! You ready? Let’s dive in! Today’s lesson is on how to prepare a stir fry sauce. This is the easiest part, because all you need to do is add all the ingredients in a jar and shake to mix. You can prepare stir fry sauce beforehand, like on the weekend, so there will be one less thing to do when you’re ready to cook in the week. The benefit of preparing stir fry sauce in bulk is that you can use it to make several meals with totally different main ingredients. It saves you tons of time, but your everyday dinner will taste different. 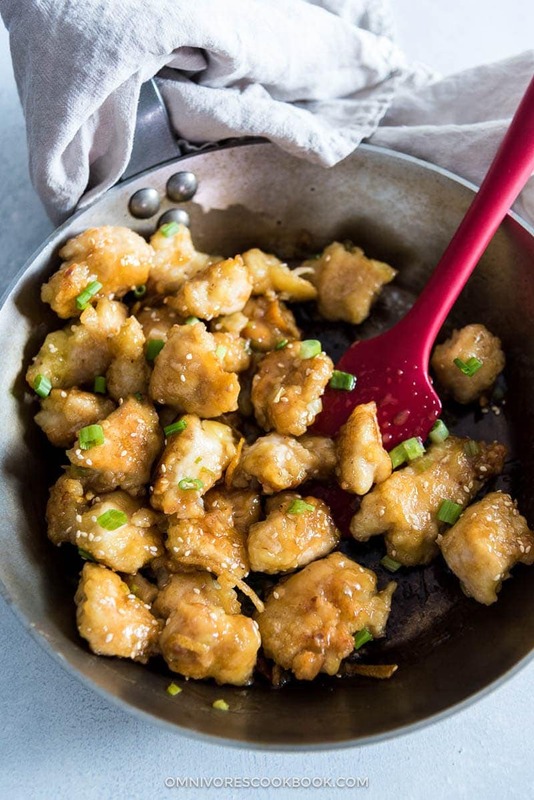 Orange chicken, orange beef, orange cauliflowers… Orange is one of the most popular flavors on a Chinese restaurant menu. So, I chose to start my stir fry sauce series with it. 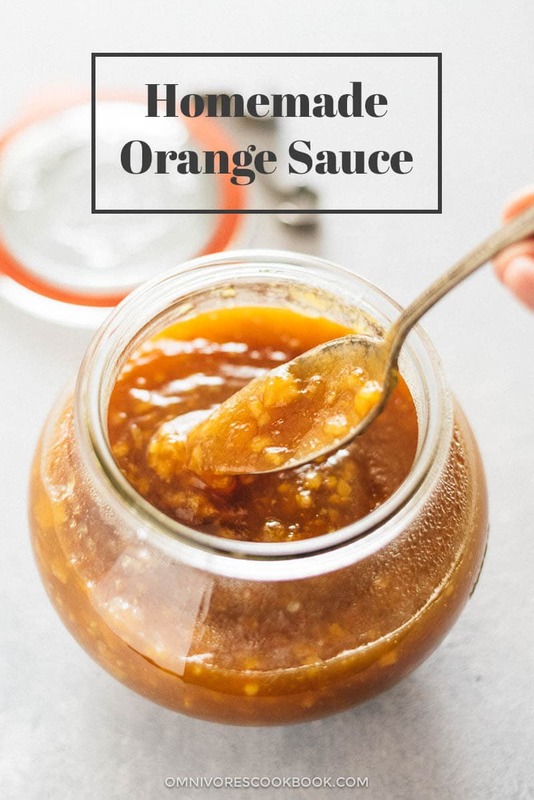 In China we do not have orange sauce – we call it tangerine sauce instead. Rather than using orange juice and orange zest, we use rehydrated dried aged tangerine peels to impart a distinctive zesty and citrus flavor to the dish. If you can find dried tangerine peels in your neighborhood Asian market, definitely grab a package. They stay good forever. In fact, they get even better (and more expensive) over the years. Look for labels that have “tangerine peel”, “tangerine skin”, or “old tangerine” on the package. The color of the dried peels is not wonderful (it has a brownish color). But, it has a richer and subtle umami flavor that fresh orange zest cannot provide. It just makes the whole dish taste much better. 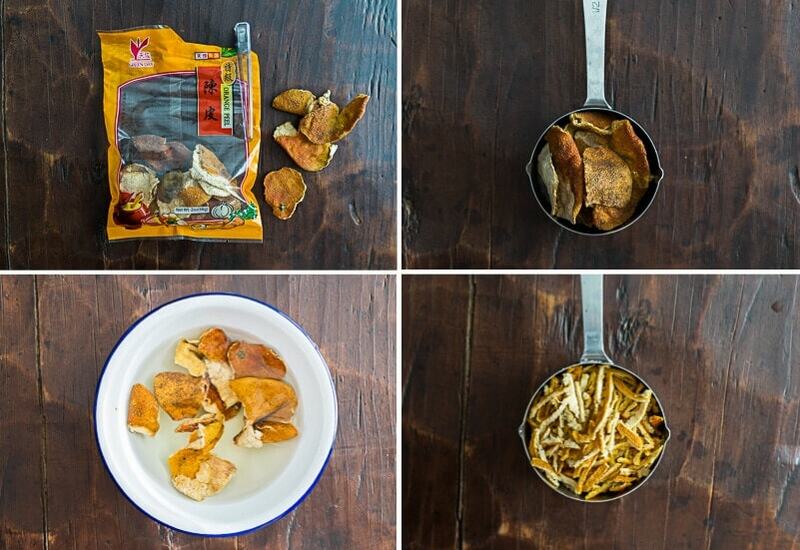 To use dried tangerine skins you need to rehydrate it first. Measure them by piling them loosely in a cup (they will expand quite a bit after soaking). Cover with hot water and let sit for 15 to 20 minutes. Once the peels turn soft, slice them into thin strips. Or, you can mince them if you like a more refined texture. Measure the sliced tangerine peel again. If you have extra rehydrated peels, store soaked peels in a fridge or let them air dry completely before storing them in a bag. Don’t have an Asian market nearby? No problem. You can easily make them at home by air drying fresh tangerine peels. 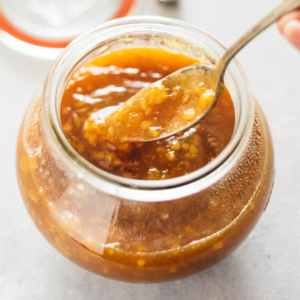 If you want to make this sauce today without it, you can use fresh orange zest instead. Your dish will still taste better than Panda Express. Simply reheat the sauce in microwave, you can add the sauce in stir fry or on roasted vegetables and protein! 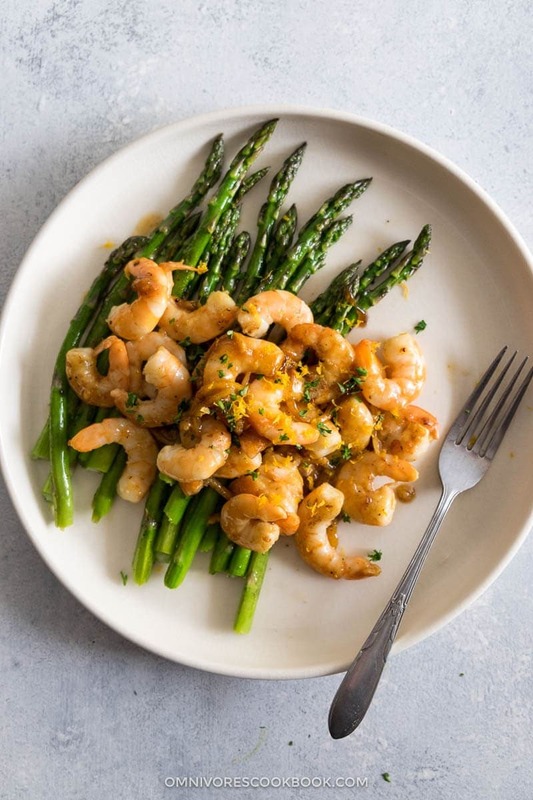 For each pound of meat or seafood, mix with 1 tablespoon vegetable oil (or peanut oil), 1/2 teaspoon salt, and 1 tablespoon cornstarch. Let marinate for 5 to 10 minutes. To create a crispy crust, restaurant-style, learn this method so you can achieve the goal without deep-frying. 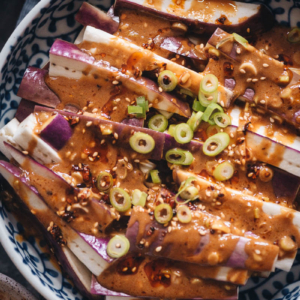 For tofu, marinate with 2 tablespoons soy sauce for 10 to 15 minutes. Drain and coat with a thin layer of cornstarch. To make a quick dinner, my favorite way is to only use one type of vegetable. You can use two, but no more. Broccoli (frozen) – Microwave for 2 to 4 minutes (depending on the quantity), so the broccoli is thawed and luke warm, but not heated up. Brussels sprouts – Roasted (see this post for how to roast Brussels sprouts). 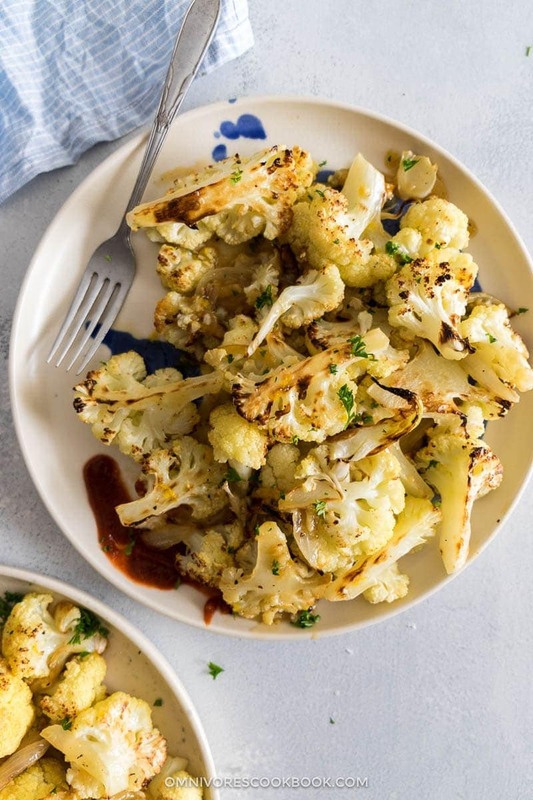 Cauliflower (fresh) – Divide to small florets; steam, blanch, or roast. Add dried tangerine skin in a small bowl and add hot water to cover. Let soak for about 20 minutes, or until the tangerine skin softens. Drain and finely slice. Transfer 1/4 cup sliced tangerine skin into a bowl, and save the rest in a airtight container in the fridge for next time. If you do not use dried tangerine peel, grate about four fresh orange skins to make 1/2 cup orange zest. Add the rest of the sauce ingredients and the rehydrated tangerine skin to a big bowl. Stir until the cornstarch is fully combined. Heat oil in a saucepan until warm. Add garlic and minced ginger. Cook and stir until you smell a strong fragrance. Stir to mix the sauce again to completely dissolve the cornstarch. Pour into the pan. Cook and stir until the sauce thickens, just enough to coat the back of a spoon. Transfer the sauce into a bowl immediately, so it won’t continue to cook in residual heat. Transfer the sauce in a airtight jar or container once cooled down. Store in the fridge for 1 to 2 weeks, or in the freezer for 2 to 3 month. Microwave sauce (1/3 cup to 1/2 cup) by 30 seconds increments. Then stir it and continue to heat until the sauce just turns hot without bubbling. If you heat the sauce on stovetop, always use low heat and stir the sauce frequently to prevent scorching. If you freeze the sauce, some of the liquid might separate and the thawed sauce looks like jelly. Simply stir to mix the sauce together and reheat in microwave or on the stove. You can restore the sauce to the previous consistency. You’ll find out the homemade stir fried dishes truly taste better, and they are not as difficult to make as you thought. I am really happy you’re focusing on stir fry sauces. I’ve been thrilled with many of your recipes, but to have good, basic stir fry sauce recipes would aid my cooking greatly. Thank you! I’ll be doing the orange cauliflower for my vegan son when he comes for Christmas. Thank you for leaving a comment and let me know that you like the stir fry sauce idea Bonnie! Made this sauce yesterday: terrific! With a chicken defrosted on the counter we had your orange chicken for dinner: fantastic outcome and indeed better then the neighborhood take-out. With a side of stir-fried brussel sprouts and rice we had happy dinner campers all the way around. And yes, no huge amount of oil to deal with: a great bonus. Can’t wait for more sauce tips & tricks. I’ll be posting more sauce recipes in the coming weeks, so stay tuned 😉 Happy Holiday! So glad to hear you enjoyed the sauce! It’s so fast and quick when you use premade sauce isn’t it? Awesome sauce, awesome dish (I tried the orange chicken dish). Thanks so much for posting all your knowledge here and making it so easy to access with clear directions and descriptions! Cooking from Beijing so it’s easy to find everything needed. Hi Kay, I had stored the sauce in the fridge for about 2 weeks without problems. But if you plan to keep it longer, I would recommend to store it in the freezer. I’ve experimented with it and it doesn’t affect too much for the sauce texture. The sauce might separate a bit, but it will restore if you stir and reheat it. Where in the hell is the orange sauce recipe ??????? I just made this sauce (with your orange chicken recipe) tonight with fresh orange zest (since i did not have tangerine peel). I used 1/2 cup, as directed. It turned out VERY potent…. almost too potent to consume! Any tips?? I love love love your website and have had HUGE success and delight in everything 🙂 so this came as a surprise. Any help or response would be appreciated. Thanks!! Hi Amy, I’m sorry to hear the dish did not turn out as well as you expected. May I ask what type of orange did you use? Did you use the big orange or the small mandarin orange? When I cook the sauce with fresh orange, I always use the big one (the type you make orange juice from). I also grate them into a bowl that is not super packed, because if you use your hand to press the zest, 1/2 cup will hold way too much zest. I have not tried it with fresh tangerine orange zest yet. But if that is the case, I’d like to test the recipe again using the tangerine orange and find out what causes the problem. It came out tasty but too much soy sauce for me. Next time I’ll try a teaspoon. It’s a keeper though. Thank you for sharing! Hi Emily, I’m glad to hear you tried out my recipe! Yes, you can definitely reduce the soy sauce if you prefer a fruitier sauce. Great recipe! I used some substitutions, and it still came out SOOO delicious! And I used fresh orange zest instead of the tangerine peels. Made this for the first time. Followed the recipe exactly. Most Excellent! Great flavor, and good texture. Will definitely make it again, with more ginger per my preference. This was a great recipe! I did cut the sugar to 1/4 cup because I bought dried orange peel that had sugar on it (they were out of the plain dried peel) and we are not big fans of sweet stuff, it was perfect. My boyfriend was a big fan, I used your orange chicken recipe as well. This is definitely going in the rotation. Thanks! Super delicious! We don’t have orange/mandarine sauce chicken in Chinese take away in Belgium, so it was the first time for me and it’s really good, thank you! I just finished making the Orange sauce (2nd time). But, the second round turned out fantastic. I used the juice of Tangarines in place of Orange juice and strained it to remove pulp and seeds. I pulverized two additional tangerine peels until it was a fine dust and added that as well. What a fantastic, flavor kick that gave it! Can’t wait to make this for hubby tonight. He has been looking forward to me making this. As a side note, I had to order the Shaoxing wine as I could not find it locally. Didn’t want to substitute and the fake stuff on Amazon is loaded with sodium. Happy to hear that you’ve been converted, Diane 🙂 It’s always great to be able to make a tastier sauce on your own terms. If we are using fresh orange zest are we using the full 1/2 cup in the sauce, or only 1/4 cup? Thanks! I made a small sample of this sauce using the portions set forth in th3 orange beef recipe. 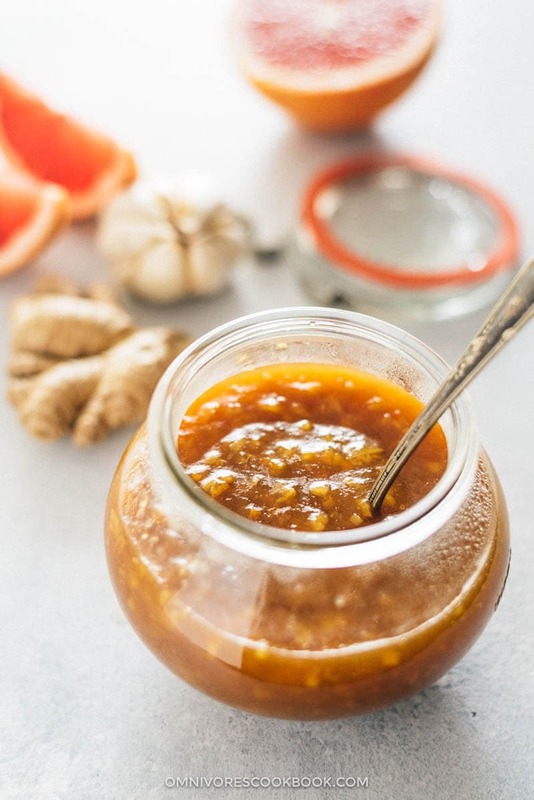 Years ago, I made an orange sauce using ground dried tangerine peel. I couldn’t find the peel locally so I dried my own orange peel and ground it to a course powder. I used 1 TBS of the powder instead of zest. The result was tasty but a bit bitter. Would store bought tangerine peel be a better choice? Should I use less of the ground peel? Hi Elliott, I think you can try using less dried orange powder next time since it’s very potent. I would use 1 teaspoon or no more than 1/2 tablespoon. Store bought tangerine peel usually works well without tasting bitter. I think probably they are aged for a longer period.